LEWISVILLE, Texas, October 10, 2017 – The Liberty University athletic staff and student-athletes had a great deal to celebrate at the ribbon-cutting ceremony of their spacious new Indoor Football Practice Facility in August. The $29 million, 95,000-square-foot structure represents not only a substantial recruitment tool and a commitment to the success of the Lynchburg, Va.-based university football program, but the next step in a two-year proposal to reclassify Liberty University as a Football Bowl Subdivision (FBS) team — joining the ranks of the NCAA’s top-tier of competition. 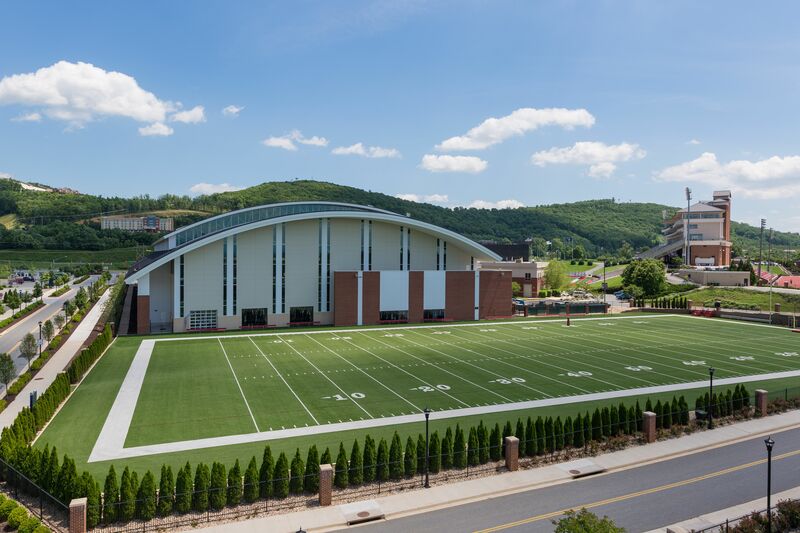 Falwell announced plans for the state-of-the-art indoor practice facility just two years ago. 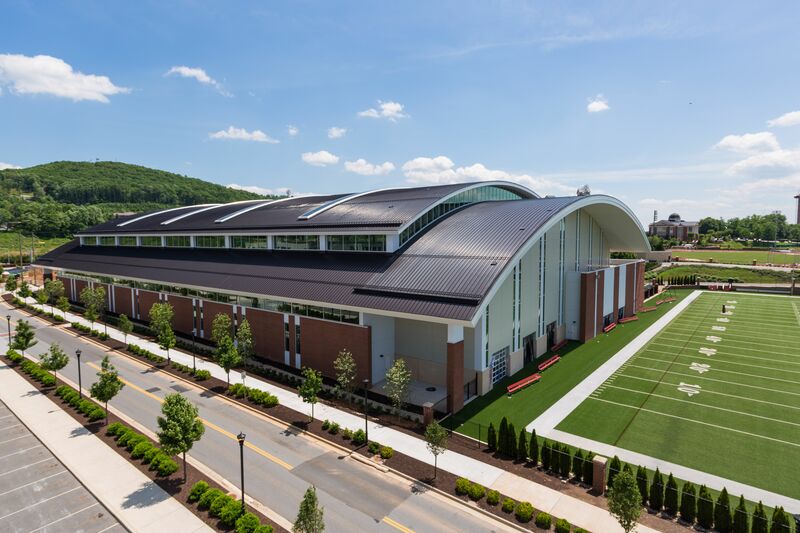 The design by Liberty University and VMDO Architects called for a 70-foot dome ceiling with clearance for booming punts and kickoffs, along with a full-size AstroTurf practice field. 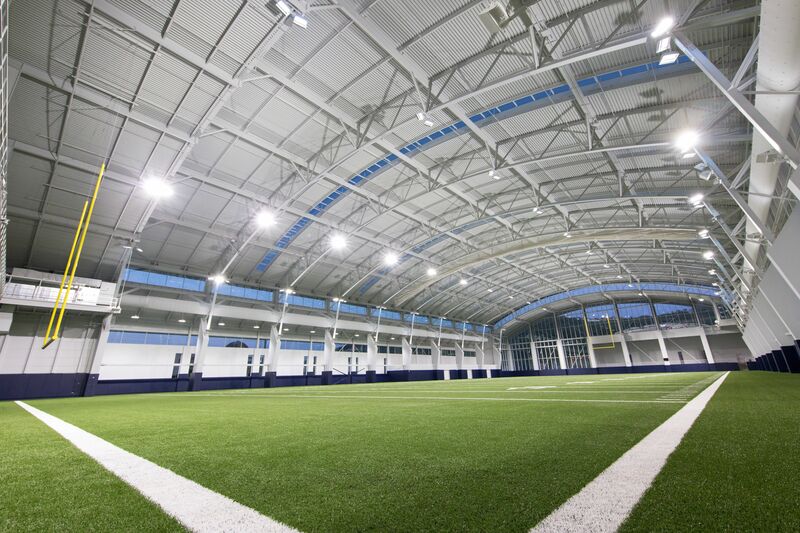 Of course, the benefit of an indoor practice facility is the team’s ability to take the field despite inclement weather. The designers at VMDO turned to an insulated metal panel (IMP) system by Metl-Span to meet the all-weather performance requirements. 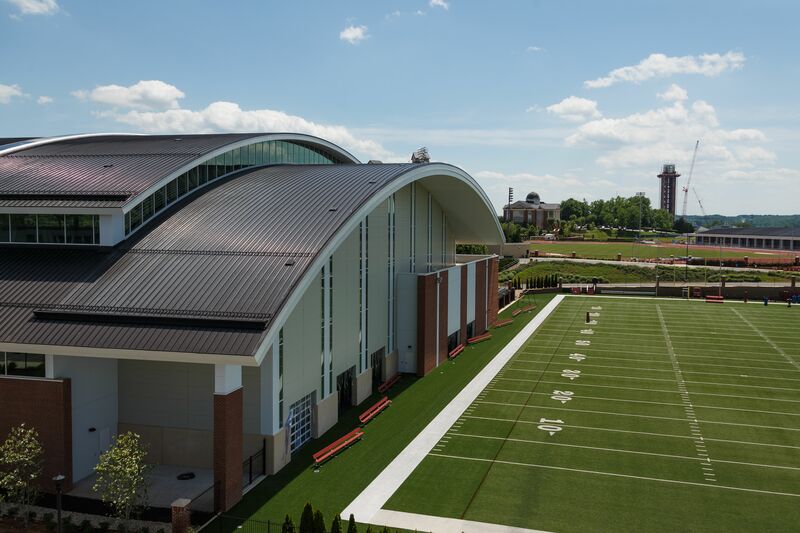 The new indoor practice facility's high-performance building envelope features over 70,000 square feet of 22/24 gauge CF Architectural IMPs. Specified in the profile's maximum thickness of four inches, the system offers an exceptional R-Value of 32.5. The crux of the Metl-Span CF Architectural IMP system is thermal efficiency in the form of polyurethane insulation. The panels provide thermal efficiency and all-weather control in a single component. IMPs provide roughly three times the insulation value of field-assembled glass fiber systems, and the highly efficient insulation delivers an added advantage by minimizing building energy usage and construction costs. Conventional, multi-component building envelopes address the critical weather barriers with multiple product sources and installation steps, leading to an overly complex wall assembly and lengthy construction schedules. IMPs provide the same performance elements in a single, easy-to-install component. According to Jack Eaton, estimator, with Ashland, Va.-based W.H. Stovall & Co., the firm that installed the project's IMP building envelope, the project’s fast-track construction schedule benefited greatly from the IMP system’s quick installation time. IMPs offer a unique combination of aesthetic design options, including mitered panel edges, superior flatness, and a vast array of profiles, textures and reveal configurations. CF Architectural flat wall profiles are ideally suited for designers seeking a monolithic architectural façade without sacrificing performance elements. The beautiful, flush panels have become a mainstay in projects in a number of high-end architectural markets. 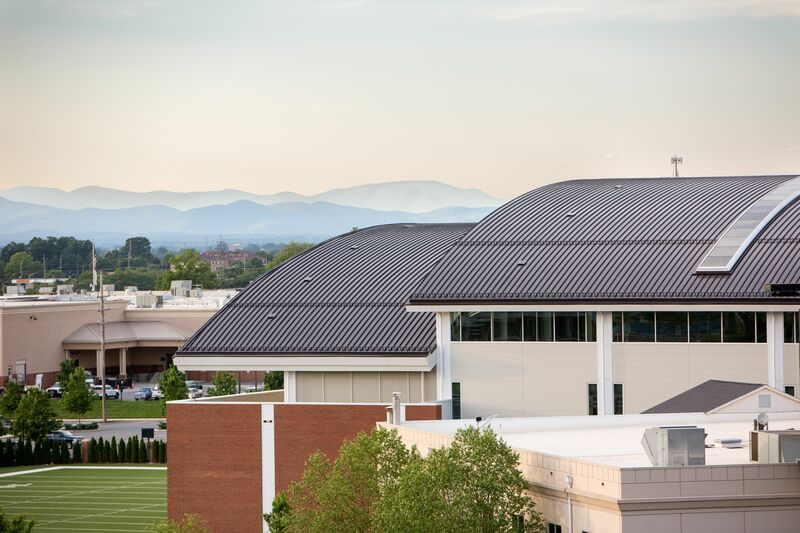 Located at the northeast end of Williams Stadium, the facility towers over the adjacent Football Operations Center as one of several recent additions to the growing Liberty University campus. 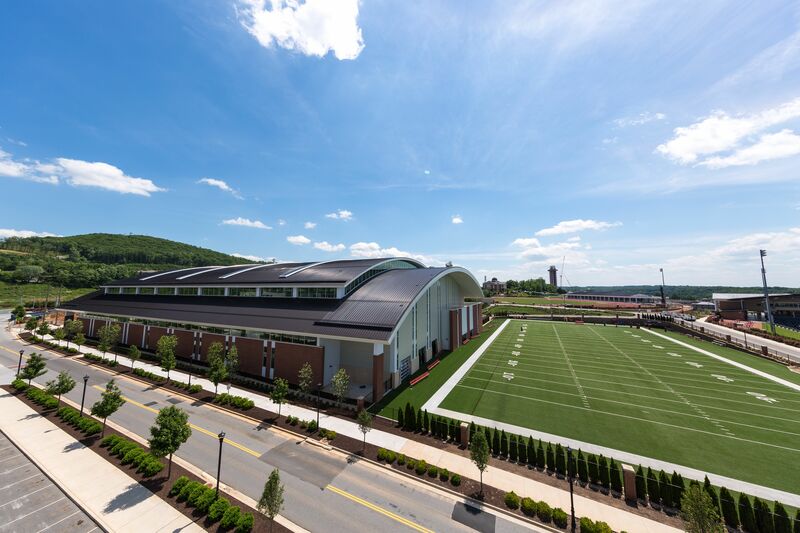 The new Indoor Football Practice Facility’s modern metal aesthetic blends the old and the new with gleaming Polar White and Sandstone hues. While Metl-Span CF Architectural IMPs provide the bulk of the building envelope, designers also implemented glass to provide natural lighting in the massive space. “The goal was to land on a design that would look good over the entire lifetime of the project, not something that would look dated a decade from now,” Eaton adds. 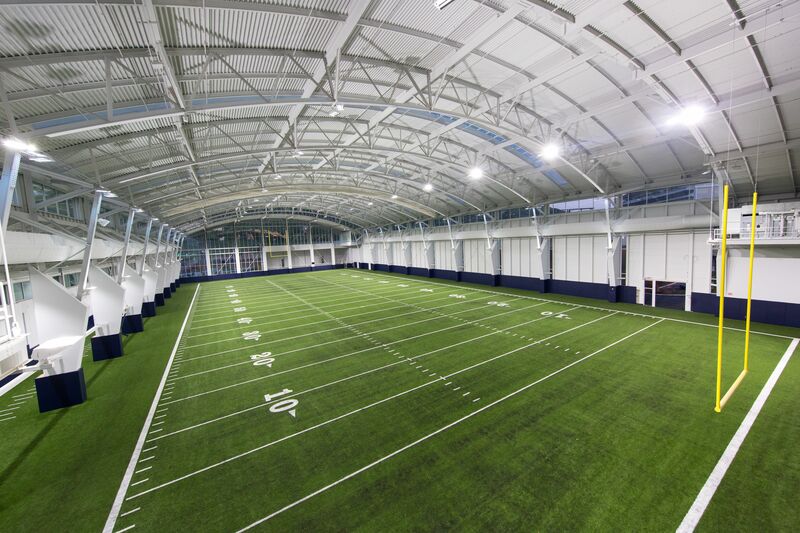 The practice facility has already become a major athletics hub at Liberty University. More than a dozen collegiate and club teams are able to take advantage of the indoor space each week. 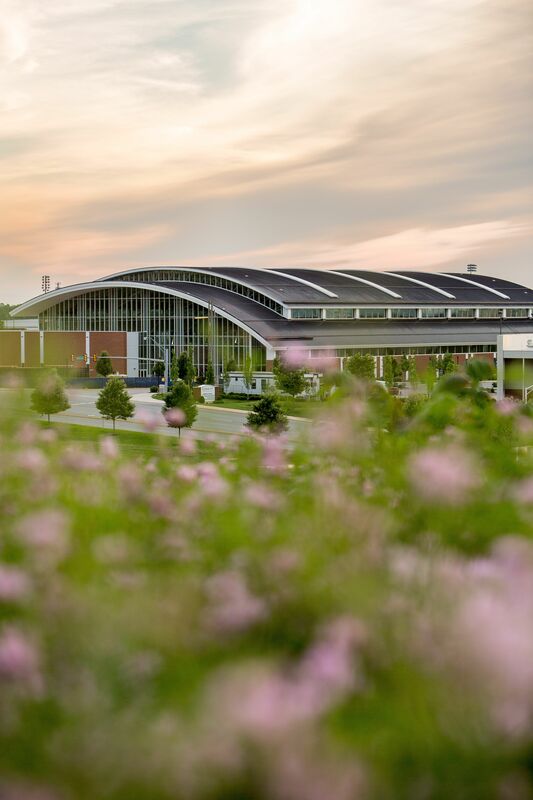 A number of additional campus improvements are also underway, including a new academic complex and a natatorium with an eight lane, 50-meter pool and a full complement of springboards and platforms. Currently under construction, the natatorium will also feature Metl-Span CF IMP cladding. Architect: VMDO Architects, Charlottesville, Va.
IMP Installer: W.H. Stovall & Co., Ashland, Va.